It is normal to think your kitchen sink is reasonably clean considering the number of times per day you use it. In this case, your kitchens sink actually harbors even more bacteria than your toilet bowl. Simply letting water run down the day throughout the day just won’t cut it with riding your kitchen sink off germs and bacteria, The kitchen is somewhat a great place for germs and bacteria to habituate, from filling the kitchen sink with warm water and letting food particles hang there all day, to rinsing your meat juice in the kitchen sink, to washing your egg yolk covered hands in the sink, I’m sure you get the point now. All these makes your kitchens sink a great place for bacteria and germs to thrive. Not only does cleaning your kitchen sink makes it germs and bacteria free, it also gives your kitchen sink surface a sparkling and glimmering look. We have been able to compile some kitchen sink cleaning hacks that would keep your kitchen sink germ free and looking shimmering. Empty the sink: You should endeavor to empty the sink, you can’t be serious about keeping your kitchen sink clean and yet leave dirty dishes lying around in your sink. Use hot water: After you may have sprinkled the entire kitchen sink with baking soda, gently add hot water to the kitchen sink and keep scrubbing with an old cloth or a sponge. Scrub the kitchen sink surface until it forms a paste. Use a toothbrush: It is always worth saving your old toothbrushes rather than disposing them as sooner than you realize, they come in handy. There is nothing that would give you that radiance after scrubbing your kitchen sink like when you scrub with a toothbrush. After you may have scrub with sponge and baking soda to form a paste, scoop up the paste with the old toothbrush and scrub it into the caulk seal around your sink the faucet and the underside of the drain flaps. Use vinegar on lime: If after scrubbing your kitchen sink and it is snot as sparkling as you expect especially the white spots that you have so much trouble cleaning around the faucet, vinegar and lime deposit would do the magic. Soak a paper towel in vinegar and then cover the spotted area with the paper towel, wait around 10 minutes and then clean with a dry paper towel. This works well on all kitchen sink fixtures except brass or colored fixtures as the vinegar may make the color run off. You can also use lemon, the acidic contents in lemon would make it easy to remove scales from your kitchen sink. Cut your lemon in half, scrubbing the lemon over the kitchen sink while paying extra attention to the scale area. Leave for a couple of hours, scrub and then rinse the kitchen sink. 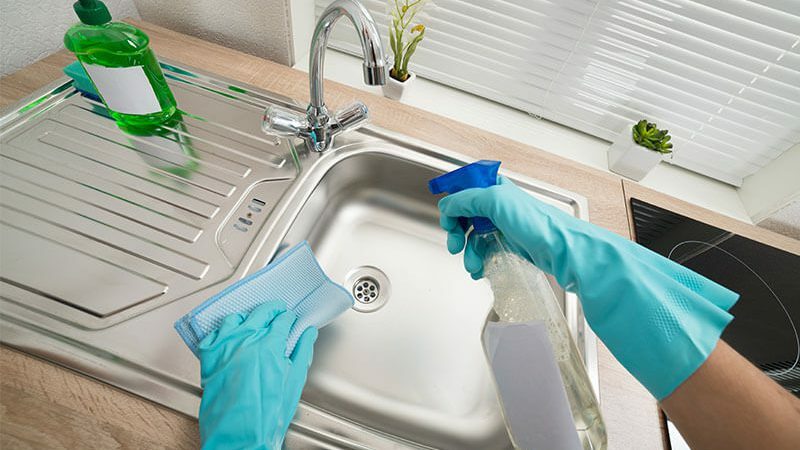 Wash up greasy dishes immediately: Another very good preventive measure to take for your kitchen sink is to avoid soaking greasy dishes in your kitchen sink for too long. Although leaving your greasy dish soaked in the kitchen sink sometimes comes in handy, more often than not, this transfers all the grease and the food on them into the water. This then leaves a grimy coating around your kitchen sink which would make it difficult for your kitchen sink to rinse clean after use. Keep your kitchen sink drain clean: You might be familiar with the popular saying “out of sight, out of mind”, but this doesn’t apply. Kitchen sink pipes have a lot of dirt in them and flushing them out every month or soon would be a whole lot hygienic. Mix 1 cup of baking soda with 1 cup of salt and ¼ cup cream of tartar and every time you want to flush the kitchen sink drain, pour ½ cup of the mixture into the drain and follow up with hot water to rinse. Scrub from the outside in: When scrubbing your kitchen sink, it is essential that you scrub from the outside in, from top to bottom, by following this tip you can be guaranteed that dirty water would drip into the areas you have not cleaned and not the spot that you have cleaned. Ensure that you take about 10-20 seconds scrubbing each area, and longer scrubbing area with visibly more dirt.